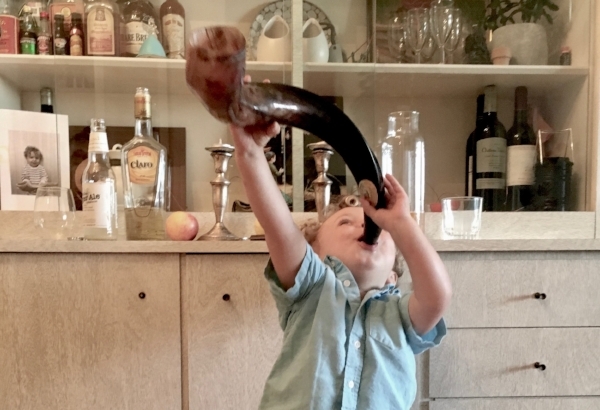 In my married life with a Jewish husband, raising a little Cajun Jew, getting ready for the school year, or as we call it back home, the start of football season, now includes getting ready for the new year, Rosh Hashanah. The first time I participated in a Rosh Hashanah tradition was when I moved to New York in 2003 to attend FIT. A few guys in black hats, probably with their mitzvah tank around the corner, set up a table on campus and gave out apples and honey. Being Cajun, I’m down with any tradition involving good food, and fifteen years later I have perfected the recipe for a Kosher Cajun brisket. It’s all about the dry roux. When I began to incorporate my husband’s jewish traditions into my own, I especially liked the additional new year celebration in my calendar. I think we can all use more than one fresh start in a year so I wholeheartedly embraced this holiday as a time to shake off the bad and aspire for greatness. The first time I ever heard about goals or even setting one was around age nine after my dad came back from a weekend business conference. He was totally psyched about goal setting so he made the whole family list 3 individual goals and write them out on a poster. The only one I remember was “Meet New Kids on the Block”. Months later I went to a NKOTB concert and coincidently stayed in the same hotel as my heart throbs! My friends and I chased them around the hotel all night. Finally we saw them face to face for 2 seconds and my friend got a Hyatt hotel washcloth from Donnie. Even though it was 2 seconds, my dad let me check off that goal and I was on my way to a lifetime of goal setting achievements. Days ago while not being able to sleep from jet lag, I ironically read an article in National Geographic on the importance of sleep. It went through much of the well known information such as REM sleep and blue screens, but it culminated in the insightfulness of dreaming. In a recent dream, I heard a booming voice sternly telling me, “You must have goals. You must focus.” It was so clear and austere that I could not not listen. I feel this dream was succinctly timed to start the new year with a bang. The last time my husband and I wrote down goals was New Years Eve 2017, 9 months ago. One goal was for my husband to get a much needed certification in his field of work, which in essence was a goal for the family. Three weeks later we were in Costa Rica working towards that goal and it was complete by May. Little did we know a tropical retreat would be included in reaching that goal, but I think that is what comes with positive aspirations. On a roll, we are daring to dream.